There are times when it would be great if we could take the bible literally rather than figuratively all the time because there are times when I really need to feel the LORD’s arms wrapped around me holding me close enough to hear his heart beat. When I am in danger I need to look out and see the LORD’s protection surrounding me. But alas, in many places the bible speaks figuratively so where we are unable to see the protection and presence of the LORD so we need to use faith and imagination. Right now I am sitting at my favorite spot by the Bridges where Lake Huron empties into the St. Clair River when I left home I could see the sunlight on the trees across from out home and as I drove along Lakeshore Road I could see it shining through the trees but when I parked my car the sun had gone behind the clouds. Sitting here I am beginning to understand even though I am unable to see the sun now hidden by layers of clouds it is still at work shining its light in an otherwise dark and cold world. I am sure you can see the connection between experiencing the sun hidden behind the clouds and our inability to see the LORD blessing us. But what about at night when the sun isn’t shining? Have you ever been afraid of the dark? I have. I’ve not only been afraid of the dark I’ve been terrified of the dark. When I was a pre-teen I would go to bed at night with a toy gun under my pillow for protection. I can laugh at it now but at the time it was no laughing matter. My greatest need during those years was light. For me light was my protection and took away my fears. 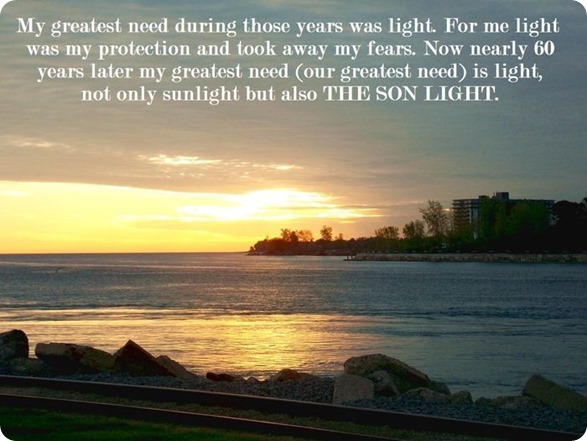 Now nearly 60 years later my greatest need (our greatest need) is light, not only sunlight but also THE SON LIGHT. And while I cannot see Jesus with my physical eyes I have the sun to remind me of him and even at night I know from past experiences that the sun will come up at just the right time each and every day. And by the way the sun has found a hole in the layer of clouds and now I can see my reflection in my computer screen. Scripture quotations marked (LEB) are from the Lexham English Bible. Copyright 2012 Logos Bible Software. Lexham is a registered trademark of Logos Bible Software.